When a company like Bethesda is trying to debug a massive game like Skyrim, where do they even start? Skyrim lead programmer Brett Douville tackled that question (and much more) on this week’s episode of Kotaku Splitscreen. Jason Schreier: Something that I bet is a really interesting topic of conversation at Bethesda is how to approach bug fixing, because there are a lot of conversations about all the weird, hilarious bugs in Bethesda games, and some people point to the engine as a problem. Some people say, ‘Oh the Gamebryo engine, they need to fix that, change that,’ even though I’m sure it’s changed drastically from game to game anyway. But I’m curious—when you’re making one of these massive RPGS and you know there are gonna be a lot of bugs, is it just a matter of sitting down and triaging and deciding, ‘Alright, we’re not gonna bother fixing all these little graphical errors?’ How do you even start when it comes to the scale of that problem? Note: “Triage” is a process in which game developers categorize bugs based on their level of priority. As a general rule, top priority is the ones that break the game. Brett Douville: Well it’s definitely triage. You lean on your QA department, and certainly we did this at LucasArts as well, where you say, ‘OK look you need to tell us what’s important, because there’s this much time between now and ship, period.’ And we may have our own ideas, certainly, and that’s part of the conversation—‘No we want to fix this and not this.’ There are bugs you’ll just leave, like who would get rid of the Warthog stuff in Halo? That’s really fun. The Warthog jumping whatever, that’s a bug, it’s ridiculous, it looks silly, and yet it’s hilarious and fun, so why not leave it? It would take forever to make a Bethesda-style game that way. It might never finish. Because they’re that big and complicated, and the combinations are so vast of things that can happen. So I think that’s at least a partial answer. Jason: When you guys were starting work on Skyrim, did you have any crazy ideas that didn’t make it into the final game? Brett: That didn’t make it? I can’t think of any crazy ideas that didn’t make it in. I think maybe the building-your-own-base stuff that’s in Fallout 4 might have been something that was discussed back then. I feel like that was a thing that was discussed going back to Oblivion as a possible thing to allow to happen in the games. I don’t think it would’ve been particularly possible on the consoles of that generation. We were already scrapping for memory, as you can tell playing the games. Adding this big, user-generated content thing on a console would not have been something I think we could’ve done. And so that’s probably one. But honestly I think dragons were kind of the flipside of that. Nobody expected them to turn out as well as they did. 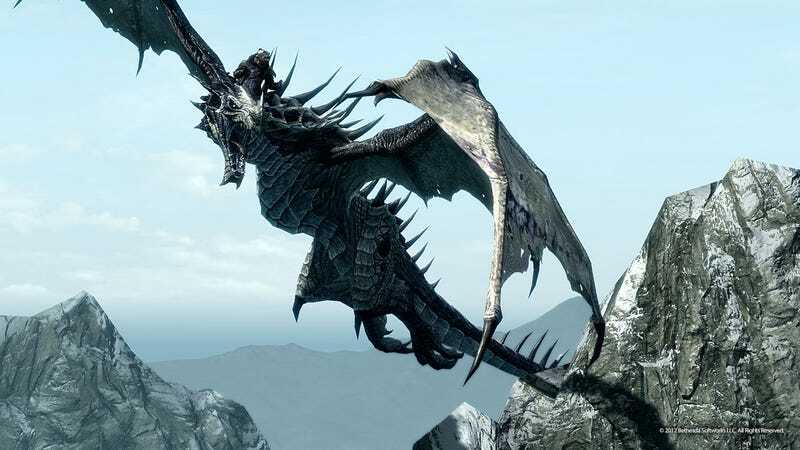 Other games that had dragons prior to that had not had them be so central. They always felt, to me as a player they always felt a little underwhelming. And when David Diangelo and some others brought that into the game, we were like, ‘Oh man, these are good.’ [Director] Todd Howard’s talked about that before, about how you bring things into the game, and you play with them, and you as a result decide to put more of a spotlight on it than you had planned to. And that’s really the magic of Bethesda games is they throw a ton of stuff at the wall, and the things that stick, they just push really hard. And the things that don’t stick you just roll back a bit. The other thing, and this was something that even made it to a mention at E3, was there had been thoughts of this vast economy and the Civil War stuff actually impacting individual town economies and things like that. And we had tried it and it wasn’t all that fun—you might have an opposite faction come in and mess with a town and now you can’t buy stuff at a vendor, and it’s like, who wants that? It’s not that kind of game.